In anticipation of the one-year anniversary of the July 5 protests in Xinjiang’s capital Urumqi, the city is heavily guarded against all possible eventualities. 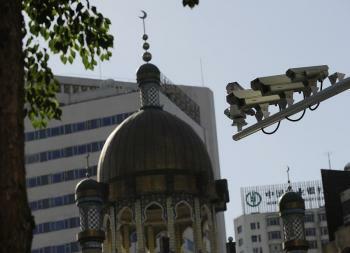 Chinese security authorities have installed more than 40,000 surveillance cameras in public locations throughout the city. Some Chinese media, including Urumqi media, iyaxin.com, reported on July 2 that a comprehensive video monitoring system has been implemented in Urumqi with the installation of more than 40,000 surveillance cameras inside the city’s 3,400 buses, at 200 bus stations, 4,400 roads and streets, 270 schools and daycare centers, as well as 100 large supermarkets, providing surveillance around the clock. These figures are as of July 1, and installations are still in progress according to the person in charge of the Urumqi Information Office. According to Associated Press, about 5,000 new police officers were hired in Xinjiang during the past year. An article on another Urumqi media site, wlmqwb.com, describes the cameras as being high-definition, riot-proof and fireproof, and capable of 360 degrees rotation with fixed focus. It also says that for key surveillance areas, a combination of spherical video camera and fixed focus lens is used, which is additionally equipped with infrared night vision so that images are clear even at night. Urumqi residents reported that special police and armed police are patrolling streets and communities, and have taken control of the entire city. An Urumqi resident, Ms. Han, told Sound of Hope (SOH) Radio Network that bags are being checked on buses and in grocery stores, and even in parks, where tables are set up solely for this purpose. [Authorities] “are extremely watchful, because it’s getting close to the one-year anniversary,” Han said. Chinese authorities claim that 197 were killed and 1,600 injured during the July 5, 2009 protest. Amnesty International released a report on July 2, challenging the official Chinese coverage of the July 5, 2009 events. Catherine Baber, Amnesty International’s Asia-Pacific deputy director, said, “The official account leaves too many questions unanswered. How many people really died, who killed them, how did it happen, and why?"